Gunnison River overlook from Eagle Valley Road. That tiny segment of river is about 1.1 miles away. 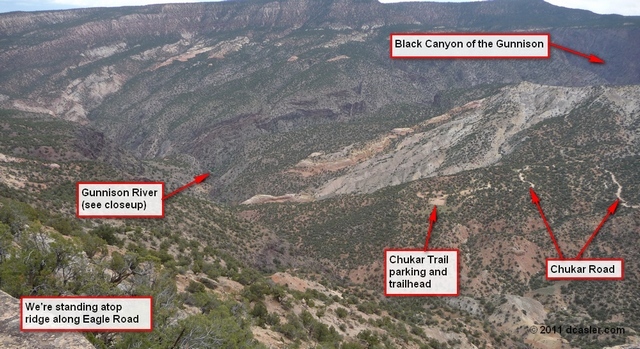 The entire area you see here is in the Gunnison Gorge Wilderness Area except for the Chukar Trailhead road and parking lot. 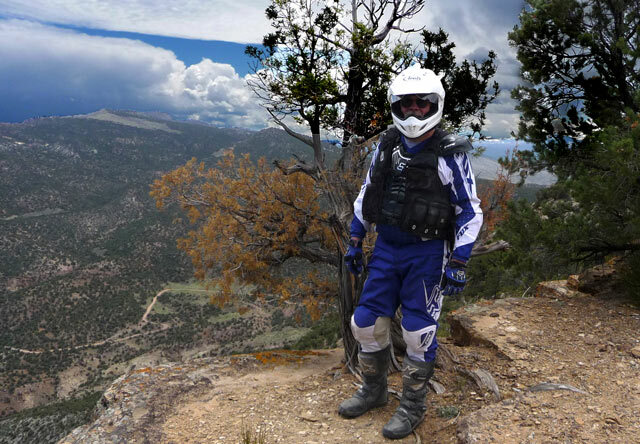 The Gunnison Gorge National Conservation Area is a delight for motorcycle riding. On May 14th, Loretta and I trailered my motorcycle up to the Peach Valley parking lot, where we met Woody and his daughter. Woody has an ATV—this was to be a joint ride. He suggested we take the Eagle Road loop. It heads up from Peach Valley and rides the ridge at the very edge of the Wilderness Area. The GPS track below shows the route. The blue loop marks Eagle Road. Yes, road. In theory it’s a Jeep trail (ha!) but in reality there are parts scarcely wide enough for an ATV. (See the top photo in a previous post to view a particularly narrow passage.) The road is alternately good, bad, and terrible. I’ve been over parts of it (the red and orange trails on the map), but had not yet done the stretch from the Tee intersection clockwise and down to where Spike’s Trail intersects the blue track. I would rate the road intermediate with a few intermediate+ sections, with some scree and some steep sections, both climbing and descending. If you’re on a motorcycle, there’s no need to go as far up Peach Valley road as we did—the orange line shows a shortcut. In theory it’s an ATV double track, but an ATV leans sideways at a pretty aggressive angle. I don’t recommend it for an ATV—leave it for the motorcycles! Now, when someone climbs as high up on the ridge as this, the views have got to be pretty good! In fact, it’s possible to see the Gunnison River if you look very, very closely. What you actually see is shown in the photo at the top of this article. Below is a telephoto zoom that shows we really can see the river, even if only about a fifty-foot stretch! On foot the river can be reached on a one-mile trail from the Chukar Trailhead, though I’ve been warned that it’s pretty steep coming back up to the parking lot. Oh, and you need to purchase a wilderness permit to leave the parking lot. Gunnison River in Gunnison Gorge, just downriver from the Black Canyon of the Gunnison National Park. The photo is taken from the ridge at the spot shown on the GPS map and is more than a mile away from our viewpoint. While there we took pictures of each other, of course. Gunnison Gorge overlook. That's Woody. I used PhotoShop Essentials 6 to bring out the clouds a bit. Gunnison Gorge overlook. That's me--Woody took the picture. A few steps to my right and it's a long way down! The views were spectacular. The following weren’t taken from the same spot, but give you an idea of the view from Eagle Road. Flat Top is just north of Montrose, CO. This view looks south from Eagle Road. The clouds are quite dramatic, don't you think? I kicked up the contrast a bit, but otherwise the photo is unretouched. At one point we could look back down at the Peach Valley parking lot, way, way down below. I cropped this shot quite a bit—it was really further away. We end with a wildflower. Any ideas? 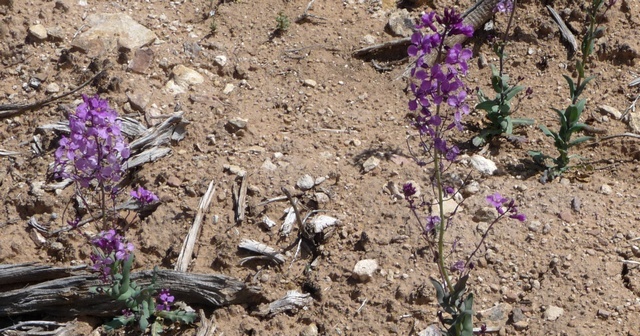 It’s not in my wildflower book. 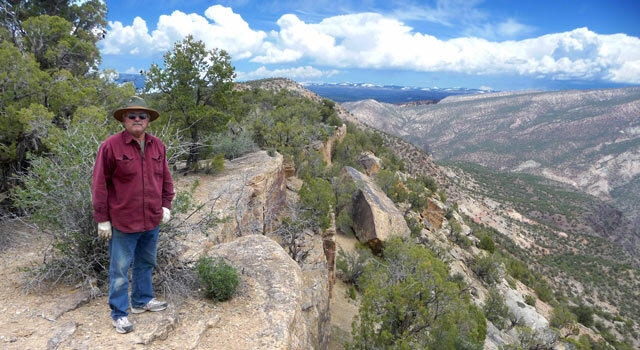 This entry was posted in GPS Tracks, Montrose County, Motorcycling, Wildflowers and tagged Gunnison Gorge, Gunnison Gorge National Conservation Area, Gunnison Gorge Wilderness Area, Gunnison River. Bookmark the permalink.